Vitalizing Welfare Technology is the development of a new paradigm of Welfare Technology that focus health promoting goals such as vitalization, participation and empowerment, not of control of biomedical values such as traditional welfare technology focus on. Musicking Fields is further development of the 5th generation of the technological platform developed in the RHYME project. SPEDUCULT is a research project within the field of Multisensory Environments (Snoezelen, Sanserom) in the Nordic and Baltic Countries. RHYME is a five year research project financed by Research Council of Norway through the VERDIKT programme. The goal of the RHYME project is to improve health and life quality for persons with severe disabilities, through use of “co-creative tangibles”. These are ICT based, mobile, networked and multimodal things, which communicate following musical, narrative and communicative principles. They are interactive, social, intelligent things that motivate people to play, communicate and co-create, and thereby reduce passivity and isolation, and strengthen health and well-being. RHYME represent a new approach on welfare technology, a cultural and aesthetic based health improving welfare technology. 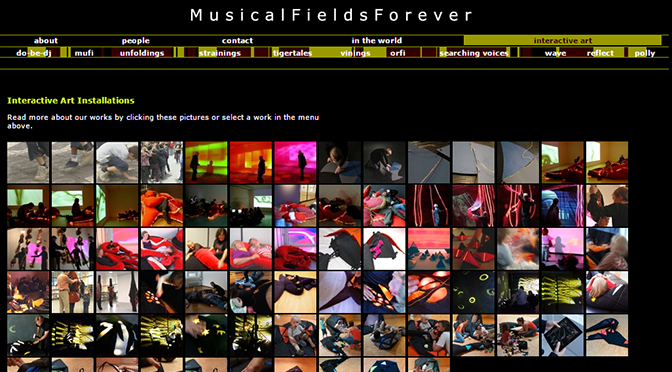 MusicalFieldsForever is a group of Artists and also a Project. We have diverse artistic backgrounds, but share the use of Networking models and the Computer as our major working tool and material. We also share a vision for the democratic potential of these technologies. The project is to explore new forms of expression in interactive media by creating open, audio-tactile art installations. We call our installations musical fields. A musical field is open for co-creation on many different levels, both on a material level, musically as well as open for diverse interpretations. Therefore a musical field can be open for different movements and actions like seeing, creating music individually and for collaboration between many people. A musical field can be open for the co-creator so that he can change between different roles and interpretations over time, just to mention some meanings of openness. The consequence of openness is therefore a hybridisation between the audience and designer-composer. The democratic potential is that everybody can become a co-creator, on his or her personal level of interaction, expertise and engagement. The group members are Anders-Petter Andersson, Fredrik Olofsson and me. We have worked together since 2000 when we met at the Swedish Interactive Institute. We have exhibited our artworks in places such as the MusicMakers event in Berlin, Ogaki Biennale at IAMAS in Japan, ICA in London (Institute of Contemporary Art), Rooseum in Malmö, Sweden (Centre for Contemporary Art), House of Culture in Stockholm, Sweden, Museum of Contemporary Art in Roskilde, Denmark, House of Culture in Hässleholm, Sweden, Designåret/Design Year H05 in Helsingborg, Sweden, DogA (Center for Design and Architecture) and Kunst og Designhall in Oslo, Contemporary Music and Art festival in Växjö, Sweden and Museum of Modern Art in Stockholm. My work in the group and with the installations is to create the concepts, the physical objects and interaction design, and video expression together with Fredrik Olofsson when we work with video projection. Founder, Project Manager and User Interface designer (interaction designer) of Skankraft Portifolio Management system. This was the first system of its kind and was launched 1.1.1994 after the liberation of the Norwegian power marked where Norway was a pioner. From 1995 we used Internet and WorldWideWeb as main communication channel of enormous amount of power data, which also was very unique for its time. I was senior system consultant and Information Manager and was responsible for all Interface Design and all communication material and international versions (English. German, Swedish). I was responsible for designing the worlds first windows based accounting system (for OS/2). It was lauched at the united global lauch of IBMs new Operating System OS/2 in 1987 which was a very ambiguous project, This is a job I still am very proud of. But my design ideas could not be realised if i did not had genius colleague like Erik Oxaal, Ole Jacobsen and Lars Kolsaker, who was able to program it and the whole system group that was able to develop it further together with me. I worked as System Consultant in the division for New Markets based on the Bridge software from SoftBridge Inc. I developed several service prototypes for branches like transportation , hotel service and teaching. One within teaching become a innovative problem based learning tool used in Swedish high school for Svenska Skoloverstyrelsen. Another become a integrated product package with Word Processing, Spreadsheet, Database in a united menu system for IBM called Connect. I worked as Product Manager for the integrated package (office suite) Framework from Ashton-Tate. Torp Edb war exclusive distributor for Ashton-Tate at the time and distrubuted the leading micro computer program dBase. My job was to develop a network of dealers, giving supporting and training to the dealers and the customers, and being responsible for the first huge translating project of software to Norwegian.